Following the trend of architectural styles in the American high-rise, Newark's tallest buildings in recent years have tended to be wrapped in curtains of silver, black and light blue glass as opposed to the brick, granite, marble and terra cotta of earlier times. Clean, minimal, swept back, unadorned, chaste and stripped of ornamentation is the rule for most commercial towers placed on the city's skyline today. Mixed and matched with earlier architectural masterpieces, our buildings, old and new, classical and modern, present the viewer with a richness of styles, eras and taste found only in America most noble cities. In 1975, Public Service Electric and Gas Co. decided to stay in Newark and demolish the rambling 12-story headquarters that had been the centerpiece of its operations since 1903. With the removal of the old building that occupied the former site of the Boudinot mansion, scene of the Marquis de Lafayette's visit in 1824, and the razing of the terminal building that had been built at the beginning of the century to untie trolley gridlock at Broad and Market streets, one of Newark's first 20th century landmarks came crashing down in a few seconds in a planned implosion. No longer would the multi-colored PSE&G rail and trolley sign illuminate Military Park at night, nor would passengers wait at the Pine Street entrance for a central city or suburban bus to take them to their destinations. Instead, a sleek new office building with a 2.5-acre plaza would come into being that would soon become yet another landmark on the site. In 1975, company President Robert I. Smith announced plans to rebuild the company offices. 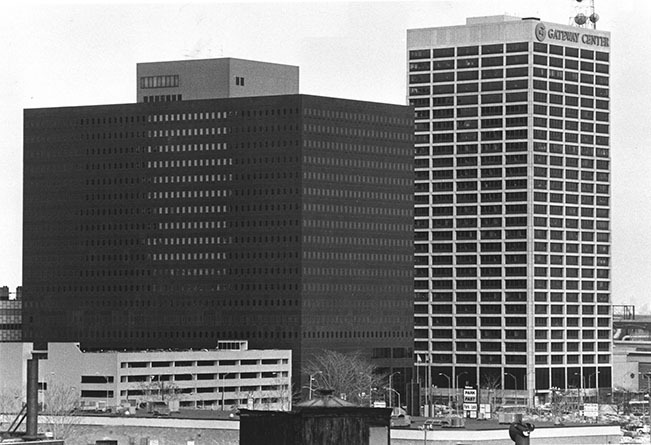 In 1980, the site was cleared for construction, and in 1983, the new PSE&G president, Harold W. Sonn, 'was pleased to put the finishing touches on the new headquarters.' Putting up a building this large involved planning, energy and resources seldom demanded of local companies. Alfred Faiella, executive director of the Newark Economic Development Corp., was quoted at the time saying, 'This building will be the biggest thing in Newark for the rest of the decade.' Impressive it was indeed, meant to accommodate 3,000 PSE&G employees as well as several floors of other tenants. The 27-story building includes 900,000 square feet, is 360 feet high, has five underground levels for energy dispatching, includes an elaborate fire detection system and is encased within a totally energy-efficient glass curtain wall construction. The adjoining plaza satellite extension includes conference rooms, training areas and dining facilities. The PSE&G lobby is on the second floor, and is reached by escalators. Black, chrome and scarlet colors dominate the utilities reception area. The Park Plaza area is one of Newark's best-known outdoor spaces, and claims status as one of its best-known amphitheaters. PSE&G's well-known logo forms the decorative motif with the use of orange and white marble chips. A large reflecting pool recirculates 200,000 gallons of water, and a 25-foot-high fountain sprays it into the summer air. A large limestone eagle from a former bank occupies the site's northwest corner, and little-leaf lindens, Japanese crabapples and Sargent junipers shade summer visitors from the hot sun. Thousands of spring bulbs announce the end of winter and the welcome of a new growing season. Throughout the year the outdoor stage plays host to rap as well as opera, art exhibitions and city fairs. Who knows, maybe even such ghosts associated with the area as Thomas Paine, George Washington and Mt. Rushmore sculptor Gutzon Borglum look down on today's events from a celestial perch and wonder what's coming next. Raymond Boulevard East, a twin office complex of 12 and 16 stories, was completed in the early 1990s by Hartz Mountain Industries and is the headquarters for New Jersey Transit and New Jersey Blue Cross and Blue Shield. The 1.15 million-square-foot dual offices are connected by a parking garage with capacity for 1,400 cars and continuing a combined commercial street and upper-level office space of 7,000 square feet. These are the only tall buildings in the Ironbound, occupying the narrow strip of land just east of Penn Station, wedged between Raymond Boulevard and the Passaic River. The post-modern buildings’ fenestration, or use of window design, is a distinctive exterior feature and visible from a considerable distance. An important part of the original complex was the Downtowner Motor Inn, which was redesigned by the Grad Associates in l977 has since become one of Hilton's heavily used and most successful hotels. It is connected to the railroad station to the east, and is located at the northern end of the shopping mall opposite the 30-story Gateway I and filled with stores, shops and a first-class restaurant, the Essex Room. Continuing our walk west in the megastructures of the Gateway, we cross over busy McCarter Highway, past the massive bulk of Gateway II, and move into another business corridor emerging in the four-story lobby of Gateways III and IV. The latest addition to the Prudential mountain of offices is the businesslike lobby leading to some of New Jersey's most important commercial offices. The nationally known Newark architectural firm of Grad Associates designed this section of the Gateway. Senior partner Howard Horii says Grad 'has been in town 90 years, both building and beautifying not only Newark but representing the city with its designs and accomplishments throughout the country and the world.' Today, Dennis Frost, general manager of the Gateway Center, operates one of the city's and state's largest office complexes. It was little more than a century ago that the Prudential built its insurance castles along Broad Street. The tradition of huge business complexes continues in Newark with modern concrete and glass towers at McCarter Highway near Pennsylvania Station – a city within a city poised to meet the commercial challenges of the present and future on a state, regional, national and global scale.